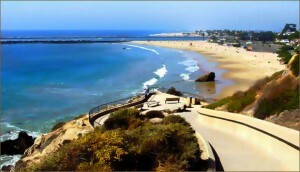 It’s summer time and in Corona Del Mar, there is a whole lotta activity going on! This means deck coatings need to be up to snuff. The beach climate invites heavy traffic, not only at the oceanfront, but at the after party on your balcony deck, patio decking, or rooftop decks. Prestige Deck Coating is the deck repair company par excellence. We focus on not only choosing the highest quality products, but expert installation, and attention to customer needs. One of our recent deck waterproofing repairs had a two-fold emphasis: dry rot repair and metal overhaul. Dry Rot Repair. The entire decking surface was trashed. We removed the existing deteriorating plywood and re-installing 3/4 inch plywood sheeting. This prepares the foundation for our 5 layer waterproofing membrane. along the deck to wall transition and incorporating the stucco screed. This is to make sure the wall will be prepared for stucco when we are done. 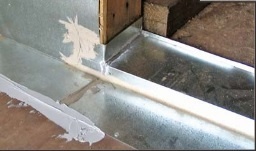 In addition, we installed L metal flashing, scupper drains and deck drains to specification. -We cut and removed the threshold, existing pan, and door trimmed to access door pan. Our deck repair company was then ready to install our Crete Decking System. We begin by stapling down metal lathe across the entire substrate, to bring strength and flexibility. This, as well as securing the perimeter with flashing installation, makes for a solid foundation on which to perform deck coating service. Our polymer modified concrete is applied for strength, adhering to the metal lathe layer. Our unique deck repair level is the the fiberglass/bonder layer. Many companies neglect this step, which completely seals out any water. We apply another layer of polymer modified concrete for extra strength, sandwiching the fiberglass. We use a pneumatic hopper gun to spray your choice of texture finish: smooth, orange peel, or knock down. Our last step is application of two coats of epoxy fortified concrete paint sealer. Prestige Deck Coating is a Deck Repair Company that is here to stay! You can choose Dex O Tex, Life Deck, Versa Deck or a number of other deck waterproofing products sway you. A long lasting deck coating needs more than great product. Proper installation and customer care round out the triple threat approach of Prestige Deck Coatings!